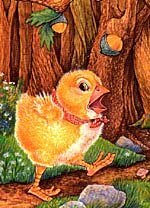 You all know the story of Chicken Little, right? The darling chick that alerts everyone that "The sky is falling!" after getting hit on the head by a wayward acorn. Well, I think I have Chicken Mother Dear on my hands. My mom can see these large trees in the field behind our house from where she sits on the sofa. The trees are really tall and wide, and a couple of their limbs lean over. If I had a dollar for everytime she has said, "Those trees are gonna come down," I think I'd be a millionaire. They were impossible to see during the summer when the trees in our yard were covered with leaves to block them from sight. But now the leaning towers of limb-dom are in full view. Aside from the constant repeating of her concern, the Alzheimer's (or maybe just old age) has affected her depth perception. While they are at least 1/10 of a mile away, she thinks (a) they are going to fall over onto our house — in which case she has a plan to run out the front door, or (b) they are going to fall on a passing car — despite the fact that they lean away from the road and not towards it.